There is nothing more frustrating than setting aside time to work on a new project and not be able to find your pattern, yarn or hook. You can spend precious minutes that could have been invested in your project while searching for the needed tools to begin. After accumulating an assortment of crochet necessities I finally decided it was high time to get them in one organized space where I could turn to and find what I needed in a matter of seconds. In every house there is a drawer, closet and even room that is the drop off point for a multitude of miss-match junk or stuff that doesn’t quite have it’s own home. 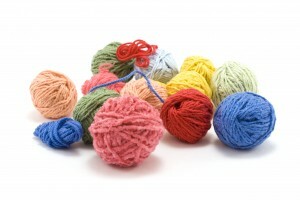 Why not revive this space into something useful–a home for your homeless crochet goodies. This will force you to find a new home for all that other “stuff” and perhaps be an inspiration to be a bit more organized in other areas of the house. Use plastic storage tubs to organize your patterns according to category: home decor, children, adult, etcetera. Tupperware plastic spaghetti containers work great to store your hooks in! Keep your eye out for them at flea markets or discount stores. Keep a shelf or storage container dedicated to the must haves for your current project, so when you have a few spare moments you can grab it and make the most of your time! This entry was posted on Saturday, October 9th, 2010 at 12:00 PM by Emilee Gettle	and is filed under Tutorials and Help. You can follow any responses to this entry through the RSS 2.0 feed. You can leave a response, or trackback from your own site. I have yet to organize my sewing/crochet/knitting/craft room but I have plans because every time I go in it I can’t find what I am looking for. I will be interested to see the posts here for some great ideas. I bought one of those shelf units with the canvas drawers. The flexibility of the drawers allows me to store lots of yarn!!! I have drawers in different colors so I can even color code my stash. One drawer is for cotton yarns, one for bulky yarns, etc. I use the low cost cardboard shoe organizers& stacking baskets. Giant pretzel and cheese puff jars are used for scraps. I have them sorted by weight. If there is too much for one jar, then I sort them by color family. My cones are all up on a shelf. I have to purge again soon. I have more yarn than what will fit in the allotted space. I have a rubber-maid xD. Currently everything’s just shoved into a bin, but that using a closet idea is sounding good since I have a pretty big closet and not much clothing. I’m a mess, no lie! My yarn end up wherever it fits. i upgraded the kids drawers and now use their old drawers for my yarn, and material, storage. Since the top drawer was broken, we turned it into a shelf and used plastic tubs to store the patterns, needles, etc. It’s great because i open a drawer and can see quite easily, what I have available. I use pretty gift bags that I’ve been given to organize my current projects. I put the yarn, project, and hook in there when I’m done working with them. It looks nice, recycles the bags, and makes it easy to just grab a bag and go if I’m taking a long car ride or spending a day at the park. I keep all my yarns in plastic bins in the closet. They’re organized by fiber and brand. My unused hooks are kept in a jar on my desk. I could definitely do with a craft room, too! A craft room would be a lifesaver right now! I just moved into a slightly smaller house with two other people, and my yarn is all in *cringe* plastic bags. At least my hooks are safe and always with me, they are in an organizer my great-grandmother made. But I like your idea, Mellie. I’ll have to find my old gift bags. I bought 4 bins that are about 8″ deep and about 24″ by 48″. I store my yarn by color so it’s really easy to go to the right one when I need something. I hate to say it, but all 4 are full….! I havbe a large master bedroom with a double chest with eight drawers , which I acquired when my daugher moved. One top drawer is for knitting needles & accessories which are sorted with straight needles , zippered needle bags and double point in a large plastic bag with each size in separate quart bags. Accessries(stitch holders, cable needles, etc) in recycled Wipes containers The other top drawer is for crochet needles & accessories. metal hooks are in a zippered needle case and plastic hooks are in an oblong plastic case from some makeup item. Accessories are in a shoe box. The other drawers have yarn and thread. One bottom drawer is for embroidery and cross stitch projects and supplies. The other has macrame cord . You wouldn’t believe that I also have and full sized five drawer chest full of crochet thread. White in first drawer, ecru in second, colors in third and unfinished projects in last two. AND….Some build it yourself shelving with various knitting yarns which I sort by yarn size. However ,my ‘Helpful’ granddaughter came for the Holidays and asked if she could organize my yarn stash and she redid it by color! Several 18 quart plastic containers, plastic shoe boxes are stuffed with knit & crochet unfinished projects. quilt quarters for planned quilt projects. My unopened carton with quilt frame is still waiting for me inmy attached storage room to begin my ‘retirement’ ambition of doing some serious quilting. Too many requests for knit crochet and macrame items from my relatives. Oh yeh, there is my free standing crosstitch frame with a wall hanging waiting to be finished. My 60 year collection of craft books are neatly filed in a two drawer file cabinet which has a sliding tilt top and a four drawer file cabnet which also includes a drawer with all my travel maps and memorbelia. Those I picked up at a thrift shop for a few dollars. I could open a shop with all I have on hand!!!! I use 2 bookshelves and storage boxes with labels for my yarn. Buttons, notions and beaded ribbon are stored in bead storage containers. I’ve recently started using 2 gallon storage bags for my projects in progress. They are so big! Wow, Such Great ideas! I like your idea Mellie about using gift bags for current projects. Keeping projects together in Walmart bags just looks cluttered and I have run off with the wrong project that required too much concentration for a Dr’s. waiting room. I am definitely going to use that one! I bought the cutest tiny makeup bag with all different colored pink polka dots on it that zips close with a cute Cupcake at Walmart. This is what I keep my tiny scissors all my crochet hooks except for Q which I can’t find right at the moment. (It’s too big for the bag) The bag is heavy duty and water proof to a point. I can keep my stitch markers and small folded copies of my favorite dish cloth pattern etc. I can tuck that and a small ball of yarn in my purse when I head out the door. Keep replying I want more great ideas! You guys are so clever! Well, I keep buying those plastic clear bins, but, the more bins I buy the more bins I need. It’s like the yarn multiplies ~ hahahahha!!!! ~ I don’t know. One thing I do know, is that I really need to get organized before it takes over my dining room. I have the clear plastic bins that are about sweater size. my hubby built shelves that are around my entire room that are above my windows and door. We never used that space so it was the perfect place. They are sorted by color and shade of color if to meny for 1 box. I like them being clear so I can see through them, so I can just grab the box I need and not having to go throught all of them. I also have my loose patterns in clear sleeves in a 3 ring binder and the books in a filing cabinit. I have my UFO’s in a bigger tote that slides under my bed and I have some bags that hold my current projects that I can just grab and go. they are really nice, they are make to stand up and then fold together to carry. I use the three unit plastic bin drawer that have rollers. I found that if you take the lid off the top drawer another set of drawers will snap on top. Right now I have four stacks that are close to reaching the ceiling. I started using one drawer for each color and then had to use two. I will have to start on another stack soon, since I have a few bags of yarn that need to be organized. My needles and a years’ worth of magazines are in a messenger bag, with a pocket each for hooks, needles and accessories. My books are on a couple of shelves, along with organizer boxes for buttons, ribbons and a plastic filing crate for printed out pages. My yarns are in colour-sorted bags for smooth yarn, a separate one for fluffy/shaggy remnants… and in a crate for aran weight that I splurged on in a sale, a vac-packed bag for baby yarns (also vac-pack bags for fur and fleece fabrics, tucked away in the closet – highly recommended, they are brilliant!). WIPs are spread between an old handbag, and a couple of little boxes. Problem is that my stuff is scattered around the house. I’d love a corner or even a whole room to bring it all together in. And I still haven’t figured out what to do with the gallons and gallons and gallons of fibrefill that I got in another sale! Plastic containers with lids; covered baskets; wine or other boxes with dividers. In my last apartment I dedicated a hallway closet to my craft projects. That worked very well. That older apt (circa 1930’s) had an amazing number of closets! My Mother-in-law made me a lovely big bag which even has a little pocket inside for hooks. I keep my spare wool in it plus books and a folder of patterns and photos of projects. The only problem is having finished one project and with another two on the go I have wool spilling over into other bags. I have 3 comforter bags — one with variegated, one with black, white, gray, blue, purple and green and one with everything else. I’d split it more, but my apartment is too small! some real good ideas. I use those plastic milk-like crates, and keep colors together so I can see right off what I have. I make a lot of afghans for friends and family, so have a load of yarn. But always want more. I keep them in the bedroom and closet. I keep what I’m working on in a canvas luggage bag that snaps shut, and just the right size to take with you. Keep on bringing the good ideas. All my yarn is in plastic bins and everything is cataloged in a spiral bound notebook.Also I wrote down the number of skeins of the yarn,the dye lot number and the ounces of the skein. My main problem is coming to terms with my yarn addiction of buying more… I can’t crochet any faster & the stash keeps growing… it even has that ‘creeping disease’ as it is creeping into other hidey holes in the house. I really do have a problem when I see yarn I love on such ‘good’ specials… I’ve even tried staying away from such shops… Anyone got a suggestion for this part of the problem??? I try to only buy yarn when I have a coupon- most craft stores will accept each other’s coupons, so I can always get what I want. My yarn is in plastic Rubbermaid boxes. My question is why is it bad to store wool inside plastic containers? I’ve never heard that before. Even in the driest climates airtight plastic containers of any kind (from Rubbermaid bins to Ziploc freezer bags) can trap moisture because that’s what they’re designed to do. This moisture will cause wool to rot. Any fiber is best stored in cloth bags, but especially natural fibers and MOST especially wool and silk since they’re the most delicate. have a great storage unit. Had been using the hanging shoe storage containers and had them all over the place. So glad to know how to store the handspun goat yarn I purchased at a garage sale! I have a shoe bag hanging over closet door that I put single yarn skeins so I can find them easier by color. A project goes into the 99 cent bags every store has and I keep them organized bag by bag so I can work on one awhile, then another, perhaps one for traveling that I can easily grab when in a hurry to go. All the yarn for each project is kept in that bag. All leftover yarn, hooks, etc go into hanging sweater keeper in back of closet. And I don’t buy single skeins anymore; I’ve learned my lessons on breeding yarn. When I moved 2000 miles away I had so much yarn I had to GIVE it away as I knew I’d never use it and was paying moving fees if I kept it. I forgot to say that at Christmas time Walmart marks down all their candy, cookies that are in these great little containers. Just pick the size containers that will keep your hooks (I have a neat Hershey M&M box that just fits the hooks perfectly) and other boxes like little suitcases to keep scissor, pins, needles, etc. handy while you’re crocheting. As a bonus you have to eat the goodies inside of them first!! I am fortunate to have a ‘Captain’s Bed’ in my spare room with two cabinets underneath the twin bed area. When I buy yarn I buy enough for a project. I use either an old gift bag or store bag to keep all the yarn together. That way I can pull a project all at one time. I keep a three ring binder with page protectors for my patterns. I try to make several copies of the pattern and keep it in each protector. That way I can pull a copy and stick it in my crochet bag when I’m working on a project. I have an old tall plastic jar (with lid) that I put my hooks in.